Time to start using more data! After announcing that it would be doubling the speed and capacity of its 4G network, we were hoping EE would also give its data allowances a boost - but, alas, that's not the case. Olaf Swantee, the CEO of EE admitted during a press briefing that "people are using more data on 4G than on 3G" (which is no big surprise), but defended the caps on its contracts revealing that on average heavy-use 4G customers get through 1.3GB to 1.4GB of data per month. Swantee explained the network was "continuing to monitor feedback from customers on tariffs", but didn't suggest a change was in the works. EE has been criticised over its lofty tariffs which require users to shell out at least £31 per month to enjoy 4G - although that only gives you 500MB of data, while 1GB will set you back £41. A reprieve may be on the horizon however, with Swantee confirming that "in the next couple of months you will start seeing devices hitting other price points in the market" - suggesting affordable options are on their way. We already know that EE will be ranging the Facebook Home-toting HTC First, but it's not clear what other mid- and low-end devices will join the fray. 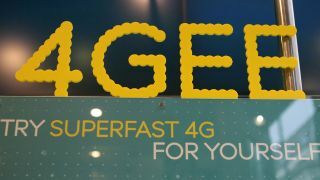 The UK's first 4G network has set it's sights high as Tom Bennett, EE's director of network services, told TechRadar: "We want to be the benchmark for 4G services worldwide. "Our rollout plan has been aggressive, but it's not stupid and we expect to have 8 per cent of our customers on 4G by the end of the year. "That's impressive growth as on average 4G networks around the world have seen 10 per cent of customers switch over during the first 24 months, and we'll have 8 per cent in just 14." EE is certainly taking the fight to the likes of O2, Three and Vodafone who won't be launching their rival LTE services until later this year, but we'll have to wait and see whether this early work pays off.